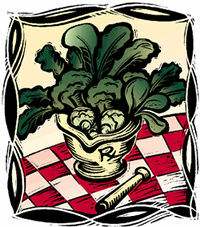 Bitter vegetables and fruitssuch as Brussels sprouts, grapefruit, cabbage, kale, mustard greens, arugula and spinachcontain dietary phytonutrients. Scientists say these nutrients could help with cancer prevention and other health benefits. But because these trace chemicals taste bitter, acrid or astringent, the U.S. food industry has devoted decades to removing them. In article published in the December 2000 American Journal of Clinical Nutrition, UW Nutritional Sciences Program Director Adam Drewnowski said that when it comes to phytonutrients, the demands of good taste and good health may be wholly incompatible. "Many people don't like to eat vegetablesand the feeling is mutual," Drewnowski says. "Plants protect themselves against being eaten by secreting natural pesticides and other bitter-tasting toxins. In small amounts, the phenols, flavinoids, isoflavones and other chemicals are proving to be good for us." Unfortunately, nature has programmed our tongues to reject their tastes. Humans and other animals have long associated bitter or sour flavors with spoiled or poisonous food. That is why food manufacturers routinely remove these compounds from plant foods through selective breeding and a variety of "debittering" processes. The fact that the amount of bitter plant compounds in the current American diet is so small is a reflection of the achievements of the agricultural industry. Debittering foods, either chemically during processing, or by breeding bitterness out of such things as broccoli and zucchini, has been a focal point of the industry for decades. Drewnowski laments this trend and says science and gastronomy must come together. The solution, he explains, is using the wisdom found in Mediterranean cuisine. For generations, cooks in Greece, Italy and France have coped with bitter vegetables by seasoning them lightly with salt and dashes of olive oil. The oil in particular blunts the bitter flavors of phytonutrients. Return to March 2001 "Briefings"